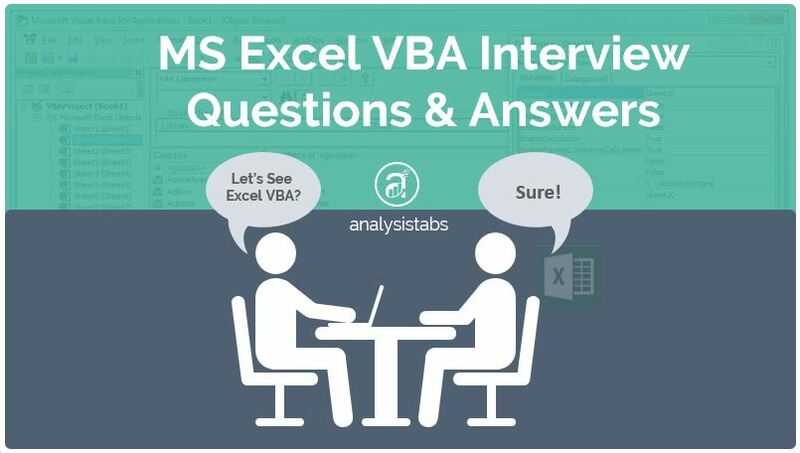 MS Excel VBA Interview Questions and Answers with Examples - ANALYSISTABS - Innovating Awesome Tools for Data Analysis! MS Excel VBA Interview Questions and Answers explained with Example macros. Here are the list of most frequently asked basic MS Excel VBA interview questions. All the questions are answered and explained with simple examples. These questions will help you to answer basic questions to deal with MS Excel VBA Programming/Development. 1 What is the basic object model of Excel? Please find the below basic Object model of Excel. 2 Why we need to use macros? A macro is nothing but set of instructions which are stored in Visual Basic module in a VBA Editor. It helps in automating common repetitive tasks on daily, weekly or monthly basis by running macro. Using macros, you can save lot of time, increase productivity and on time delivery to customers. 3 What is the shortcut to go to VBA editor screen? 4 How do I stop recording macro? Step 1: Go To Developer tab from the main ribbon of Excel window. Step 2: Click on ‘Stop Recording’ command button to stop from the recording macro. 5 How do I delete macros from the workbook? Step 3: Once you click on the Macros command button, Macro dialog box will appear on the screen. Step 4: Select macro name which you want to delete macro and then click on ‘Delete’ command button. Step 5: Now, It will show the confirmation dialog box. Click on Ok to delete the macro. 6 How to run macros automatically while opening Workbook in Excel VBA? This is one of the most commonly asked Excel VBA Interview Questions and Answers. You can use Workbook_Open() Event to run macros automatically in Excel VBA while opening Workbook. To get Workbook_Open() Event in Excel, please find the following steps. 1. Go To VBA Editior. 2. 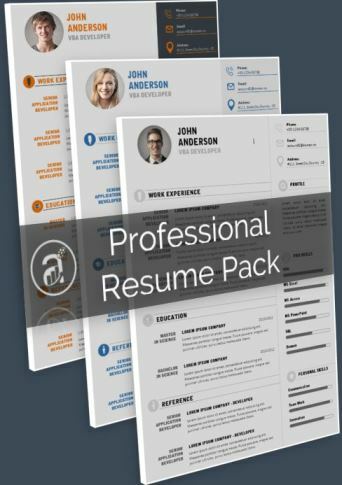 Click on ‘ThisWorkbook’ from the Project Explorer. 3. Now, you can see two drop down lists in the right side. 4. Select ‘Workbook’ from the first drop down list and then choose ‘Open’ from the second drop down list. 5. Now, you can see the following code. 6. You can add the code in-between the above lines to run a macro. 8. Now, reopen the workbook to test the macro. In the above example, the macro will run automatically when we are opening workbook. Now, it will display message like “Workbook has Opened Successfully.”. Or we can also define a procedure named Auto_Open() in any code module, this will execute while opening the macro file. 7 How do I show UserForm each time when I open workbook? You can use Workbook_Open() Event to show UserForm automatically in Excel VBA when we open Workbook. 3. Now, you can see two drop down lists in the right side of the VBA Editor window. ‘ Here “MyForm” is the UserForm name. In the above example, the macro will show the UserForm(Named ‘MyForm’) automatically when we open Workbook. Note: Before running above macro add UserForm and then assign the name of the UserForm to ‘MyForm’. 8 What is the difference between ByVal and ByRef? ByVal vs ByRef in VBA is also one of the most frequently asked Excel VBA Interview Questions and Answers. Note: Default value is ByRef. It is good practice to include the ByRef declaration if you are going to change the value of the parameter. 9 What are the available looping statements? Please find the different looping statements which are available in Excel VBA. 10 How to add a UserForm or module or class to a VBA Project? Please find the following steps to add UserForm or Module or Class Module to the VBA Project. Step 1: Go To Insert menu in the VBA Editor window. Step 2: Click on ‘Module’ to add to the Project. Now you can see added Module in the Project Explorer. Default module name will be ‘Module1’. You can change the module name with using properties. Step 2: Click on ‘Class Module’ to add to the Project. Now you can see added Class Module in the Project Explorer. Default Class module name will be ‘Class1’. You can change the class module name with using properties. 11 How to create object Variable for workbook, worksheet, etc.? We can create object variable and it can use in entire procedure. Please find the following examples to create object for workbook, worksheet, etc. Explanation: In the above example, I have created and assigned to Active Workbook to ‘Wb’ objet. And then I have used it in the next statement(MsgBox Wb.Sheets(1).Name) to display first worksheet name. 12 What is an array? An array is a set of variables that are similar type. Using an array, you can refer to a specific value of an array by using array name and the index number (also called subscript). We can create and define size of an array variable in the following way. In the above statement ‘aValue’ is an array name and ‘2’ indicates an array size. 13 How to assign values to an array? We can assign values to an array in the following way. 14 What is meant by Data Type? Data Type: A data type tells, what kind of variable we are going to use in a procedure or function. The information that specifies how much space a variable needs called a data type. Before using variable, we need to know how much space the variable will occupy in memory, because different variables occupy different amount of space in memory. We can declare the variable in the following way. Where iCnt represents VariableName and Integer represents Datatype. 15 What are the various data types available in the VBA? The following are different data types which are available in Excel VBA. Byte, Boolean, Integer, Long, Single, Double, Currency, Decimal, Date, Object, String, Variant and User defined data types. For more information please find the following link. 16 What are the different UserForm Controls and ActiveX Controls? Button, Combo Box, Check Box, Spin Button, List Box, Option Button, Group Box, Label, Scroll Bar, etc,. Command Button, Combo Box, Check Box, List Box, Text Box, Scroll Bar, Spin Button, Option Button, Label, Image, Toggle Button. 17 How to assign macros to a button? Please find the following steps to assign macro to a button. Step 1: Go to the Developer tab from the excel ribbon menu, go to Forms Control group. Step 2: Click on Button from the Form Controls. Step 3: Click the worksheet location where you want the button to appear. Step 4: Drag the button in the sheet. Step 5: Right click on the button, click on Assign Macro. Step 6: Assign Macro Dialog box will appear now, click the name of the macro that you want to assign to the button. Click on OK. Step 7: You can format the control by specifying control properties. Step 8: Click on button to test. Now, your macro should run. 18 What is meant by scope of variables? Understanding the scope of variables is very important for VBA Developers, it is also one of the most frequently asked Excel VBA Interview Questions and Answers. When we are working with variables, it is important to understand the Scope of a Variable. The Scope describes the accessibility or life time or visibility of a variable. 19 How to find last row in the worksheet? We need to find Last used Row with data if we want to perform certain task on each row of worksheet. Please find the following statements to find last row in the worksheet. 20 How to find last column in the worksheet? We need to find Last used Column with data if we want to perform certain task on each column in the worksheet. Please find the following statements to find last column in the worksheet. 21 - How to fasten the VBA macro? We have several best practices to follow while coding VBA. This is also one of the most frequently asked Excel VBA Interview Questions and Answers. This helps interviewer to understand your real time experience in VBA. We can fasten the execution of macros or VBA Procedures by following the below tips. 1. Declare the variables and avoid using ‘Variant’ Data Type. 6. Use vbNullString instead of “”. 7. Release memory objects at the end of the procedure. 22 - How to enable/disable screen updating? Or how do I hide the process of running macro? Enabling and Disabling the Screen updating will be used in almost all projects. Questions on understanding the screen updating are also one of the most frequently asked Excel VBA Interview Questions and Answers. Here is the approach to enable or disable screen updating or screen flickering. 23 - How do I stop triggers or display alerts or error warnings while running macros? Here is the approach to stop trigger or display alerts or error warnings. 24 - What are the different types of error handling techniques? Please find the below different types of error handling techniques. 25 - How to check whether file exists or not in a specified location? You can find a specific file exist or not in the following two ways. Here is the example to check file exist or not using ‘FileSystemObject’. MsgBox "File Does Not Exists." Here is the example to check file exist or not using ‘Dir’ function. 26 - How to save workbook using Excel VBA? You can save the workbook using following example. In the below example we are adding new workbook and then assigned it to object named Wkb. Finally we are saving workbook with using Save method of workbook object. Please find the following link for more information on saving workbook using Excel VBA. 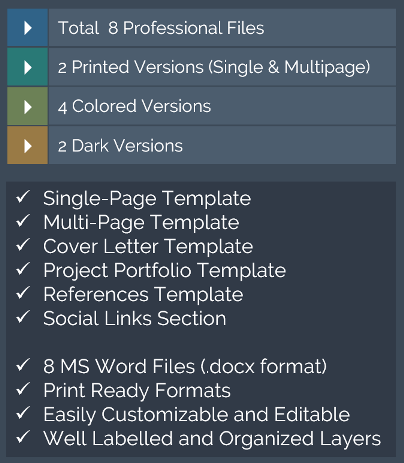 27 - How to change the existing file name? You can change the existing file name of workbook using the following example. In the below example we are adding new workbook and then assigned it to object named Wkb. Finally we are changing workbook name with using SaveAs method of workbook object. Please find the following link for more information on changeing the existing file name. 28 - How to delete a file in a specified location? Please find the following statements to delete a file from the specified location. Note: Before deleting file from the specified location, we have to check whether file is exists or not in the specified location. In the above example we are using statement:’ FSO.FileExists(sFile)’ to check for the file. Please find the following link for more information on deleting a file in a specified location. 29 - How to copy a file from one location to another location? You can copy a file from one location to another location in the following way. Please find the following link for more information on copying a file from one location to another location. 30 - How to move a file from one location to another location? You can move a file from one location to another location in the following way. 31 - What are the available file extension names in Excel? Please find the following file extension names available in Excel. 32 - How to delete row(s) in the worksheet? Here is the example to delete entire row(fifth row) in the active worksheet. 33 - How to delete column(s) in the worksheet? Here is the example to delete entire column(s) in the active worksheet. Please find the following link for more information on deleting columns in a Worksheet. 34 - How to change the cell color? Please find the following example to change the cell(3rd row, 2nd column) color. Please find the following link for more information on changing the cell color. 35 - How to change the range color? Please find the following example to change the range(A1 toB5) color. Please find the following link for more information on changing the range color. 36 - How to hide/unhide a row(s)? Please find the following example, it will take you through how to hide or unhide single or multiple row(s). Please find the following link for more information on hide or unhide rows. 37 - How to hide/unhide a column(s)? Please find the following example, it will take you through how to hide or unhide single or multiple column(s). Please find the following link for more information on hide or unhide columns. 38 - How to hide or unhide worksheets? Please find the following examples to hide or unhide worksheets. 39 - Can you lock cells such that only specific users can modify them? 40 - How do I open workbook? In the above example we are using ‘open’ method of workbook object to open workbook. Please find the following link for more information on opening workbook. 41 - How do I close workbook? In the above example we are using ‘close’ method of workbook object to close workbook. Please find the following link for more information on closing workbook. 42 - What is the difference between VB6, VBA and VB Script? All these three programming languages are developed based on ‘BASIC’ programming language. VB5: VB6 is a Visual programming language developed to help the users to easily develop the Windows Applications. VBA: VBA is Visual Basic Programming for developing MS Office Applications. It’s available in all MS Office Tools, such as MS Excel, MS Access, MS PowerPoint and MS Word. VB Script: Visual Basic Programming for Web Browser (Microsoft Internet Explorer). You can write the VBScript in html pages to program the different objects in Web Pages. 43 - What is an Offset? Offset is formula, it is useful to find a specific range from the particular cell or range. It will change the cell or range position based on specified row and column. In the above example Height and Width parameters are optional. Please find the following link for more information on Offset. 44 - How to protect or UnProtect worksheet? Please find the following examples to protect or UnProtect worksheet. In the above example we are protecting the worksheet by using ‘Protect’ method of Worksheet object. In the above example we are unprotecting the worksheet by using ‘UnProtect’ method of Worksheet object. Please find the following link for more information on unprotecting worksheet. 45 - How to find last used row in a worksheet? Here is the example to find last row in a worksheet. Please find the following link for more information on finding last row in worksheet. 46 - How to find last used column in a worksheet? Here is the example to find last column in a worksheet. Please find the following link for more information on finding last column in worksheet. 47 - What is the difference between Function and Subroutine? A set of statements to perform a specific task which is placed in a procedure called Function or Subroutine. Here is the difference between Function and Subroutine. Function will perform calculations based on specified conditions and then return a single value as a result. You can use function anywhere in the procedure and you can use number of times based on the requirement. You can use ‘Exit Function’ or ‘Return’ from immediate exit from a function procedure. Please find the following function statements. Subroutine cannot return any value and it will perform set of actions. We can declare any number of procedures or functions in a module. Procedures or functions can be called in another procedure procedure. You can use ‘Exit Sub’ from immediate exit from a Subroutine or procedure. Please find the following subroutine statements. Use function procedure to return any value, Otherwise use a Sub procedure. 48 - How to debug a VBA code? 49 - What is the method for returning more than one values from a function in VB? i) Create a class with the properties you require to return and then return the object of the class from the function. ii) Using ByRef for the values. 50 - Does VBA Supports oops concepts? VBA is Objected Based Programming Language, not Object oriented language. It will not support all ruled of OOPs concepts, like Inheritance, Multithreading. 51 - What is the difference between used range and current range? Current range will be the range used surrounded by a range. And the range which you have used in your entire worksheet is called Used Range. For Example, you might have entered some data at Range A1:D10 and then Range A20:D30. Current Range of A1 (or any range in A1:D10) will be Range A1:D10. Similarlly current range of A20 .. or D30 will be A20:D30. And the used range of the worksheet will be A1:D30. One worksheet can have one or more current regions, and only one used range. So, used range will be collection of current regions. Current region will be used to change the formats or calculations to particular block of range (region). And used range will be used to deal with the entire used range in the worksheet. Current region will connected with at least on data cell (non empty cell). And the used ranges will consider if any range or cell is used once and even if the cell is blank. You can used the below procedure to find the used range in a worksheet. As explained above, once you use any range it will be considered as used cell even after deleting the content in the cell. To get the used range with the data, please refer our examples on finding actual used range in the worksheet. 52 - Which property of textbox cannot be changed at run time? It is ‘Multiline’ property of textbox cannot be changed at run time. 53 - How do I clear the content and formats in a Range? You can clear the content and formats using ‘Clear’ method of range object in a Range. 54 - How do I clear the formats in a Range? You can clear the Formates using ‘ClearFormates’ method of range object in a Range. 55 - How do I clear the Hyperlinks in a Range? You can clear the Hyperlinks using ‘ClearHyperlinks method of range object in a Range. 56 - How do I clear the Contents in a Range? You can clear the contents using ‘ClearContents method of range object in a Range. 57 - What is option Base? Option Explicit makes the declaration of Variables Mandatory. Option Base is used at module level to declare the default lower bound for array subscripts. Default array lower bound value is 0. If the default value is 0, then the Option Base statement is not required. If used, the statement must appear in a module before any procedures. Option Base can appear only once in a module and must precede array declarations that include dimensions. Example: Option Base 1 will make the array lower bound as 1 instead of 0. Used at module level to declare the default lower bound for array subscripts. 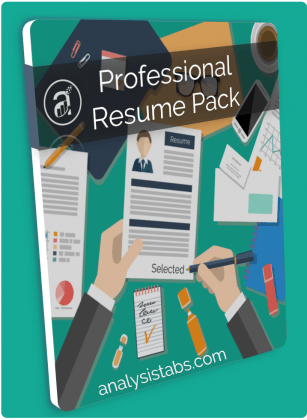 Here is the link for more VBA Interview Questions and Answers. These are explained for examples.